Going via a plane for the very first time? Don’t know how to use its toilet? Or pondering where does all the poop go? Well, we are here with the answer to quench that childhood curiosity of yours. And for your information, It isn’t simply dumped into the air to fly around and let gravity do the dirty work. Then, what exactly goes around in a washroom that’s 10,000 feet off the ground. Read the article and get to know the exact answer to it. Do you have a fear of using a toilet in an aeroplane? Do you hold it through the entire flight in worrying where ever it may drop? Well, that’s unhealthy, dude. You must be imagining where those tons of poop are docked over? Then, here is the perfect answer to your question. 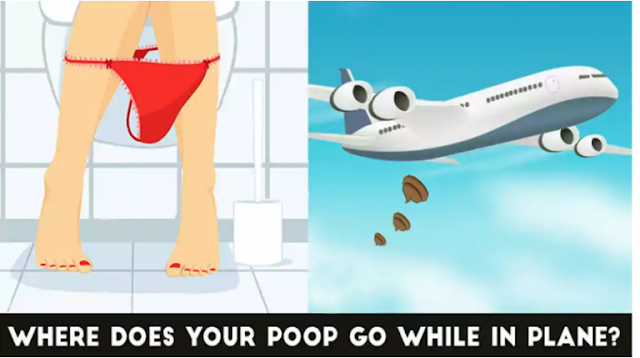 Your poop comes from your belly and goes to the plane’s belly. Isn’t it interesting? I know it sounds ridiculous. Every plane has a number of tanks onboard to collect your waste. When you flush down your poop, it goes into a suction tank or holding tank until it doesn’t cross its limit. Yep. You read it right. Want to know the exact quantity of a storage tank? …the lavatory service truck is pulled out and hooked up with the receptacle on the bottom. This is how yours and other passengers’ smelly poop comes out. If you have found the perfect answer for your hilarious question, then do share it with others. Let them too clarify the doubt that haunted their childhood minds.